Brooke Allen reviews a handy new tome for those who live in comfort and safety but who perceive threats large and small from all crevices and all angles. Paradoxically, most people in the West are generally safer than any previous generations, and yet they imagine existential threats ranging from viral pandemics to hemispheric mega-storms. Never in our history have Americans been so fearful; never, objectively speaking, have we been so safe. Except for the bombing of Pearl Harbor and the destruction of the World Trade Center, war has not touched our shores in a century and a half. Despite relative decline, we are still militarily No. 1. We have antibiotics, polio vaccines, airbags; our children need no longer suffer even measles or chicken pox. So what are we all so frightened of? 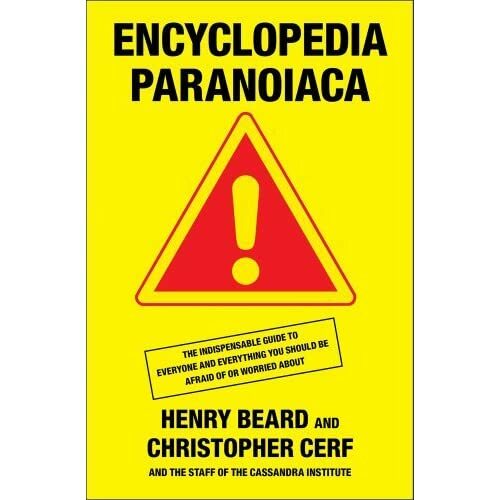 In “Encyclopedia Paranoiaca,” Henry Beard and Christopher Cerf—in association, supposedly, with the staff of something called the Cassandra Institute—try to answer that question in some detail. The result is an amusing and cruelly accurate cultural critique, offering a “comprehensive and authoritative inventory of the perils, menaces, threats, blights, banes, and other assorted pieces of Damoclean cutlery” that hover over our collective head. There’s the big stuff, of course: global warming and nuclear warfare, not to mention super-volcanoes and mega-tsunamis “capable of crossing entire oceans at jet-airplane speed and wreaking almost unimaginable damage.” The authors don’t even bother to list terror attacks or hurricanes, both high on the list of national obsessions after the events of recent years. But they do dwell on financial perils. “Investments, domestic” and “investments, overseas” are both listed as dangers, as are “gold, failure to invest in” and “gold, investing in.” Damned if you do, damned if you don’t—as with so many of life’s decisions. Our understandable fear of outsize disasters is matched, oddly enough, by an equally paralyzing terror of the microscopic. American germophobia has only intensified in recent years, as we can see from the sudden ubiquity of hand sanitizers. Messrs. Beard and Cerf gleefully fan the flames of our paranoia. Toilets, flushing of: You’d do well to keep the seat down when engaging in this hazardous activity, because toilet water and all its contents are vaporized by the flushing action and settle upon everything in your bathroom—including your toothbrush. A lovely hot bath turns out to be, according to a scientist at NYU Medical Center, a foul stew of pathogens, with up to 100,000 bacteria per square inch. But showers are not much better—they distribute the scary Mycobacterium avium. And your kitchen is even yuckier than your bathroom! Dishwashers carry fungi on the rubber band in the door. Kitchen sinks: According to one scientist consulted by the authors, “if an alien came from space and studied bacteria counts in the typical home, he would probably conclude he should wash his hands in the toilet, and pee in your sink.” Sponges: Their “damp, porous environment serves as a perfect breeding ground in which the microbes can flourish and multiply until there are literally billions of them.” Cutting boards—let’s not even go there.